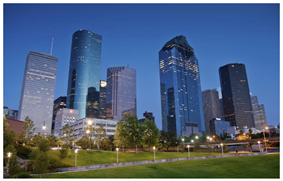 ​​HOUSTON – Houston has been ranked seventh as one of the best brands in the U.S., based on place, product, programming, people, prosperity and promotion, per Resonance Consultancy's 2016 U.S. Place Equity Index. A city's brand is important, per the report, because as economies have become more focused on services and technology, a city's location becomes less relevant for a city's prosperity. Houston scored best in the product, programming and promotion categories — ranking No. 7, No. 9 and No. 10, respectively. The Bayou City also took the No. 17 and No. 18 spots in prosperity and people categories, respectively, but it ranked No. 70 out of 100 in the place category. Factors considered in the place ranking includes average air quality index, average number of sunny days and crime rate, among other things.